Boost N Lock: pH drops have many causes; restoring pH is the first step in fixing a poorly-performing digester. Qwik-Zyme L: Fatty acid and FOG build-up results in foam and operational issues that eventually cause pH to drop. Anaerobic Food Supplement: Incoming waste can quickly overpower low methanogen populations, causing foaming and excess acid production. BioGas1: Poor gas production is often caused by a trace metals deficiency. Some foam is almost always present in anaerobic digesters which is a result of methane production in an anaerobic process. Generally acids produced during acetogenesis (acid generation) lower the surface tension of an anaerobic digester somewhat. This allows for greater quantities of gas to be trapped at the surface of the supernatant. 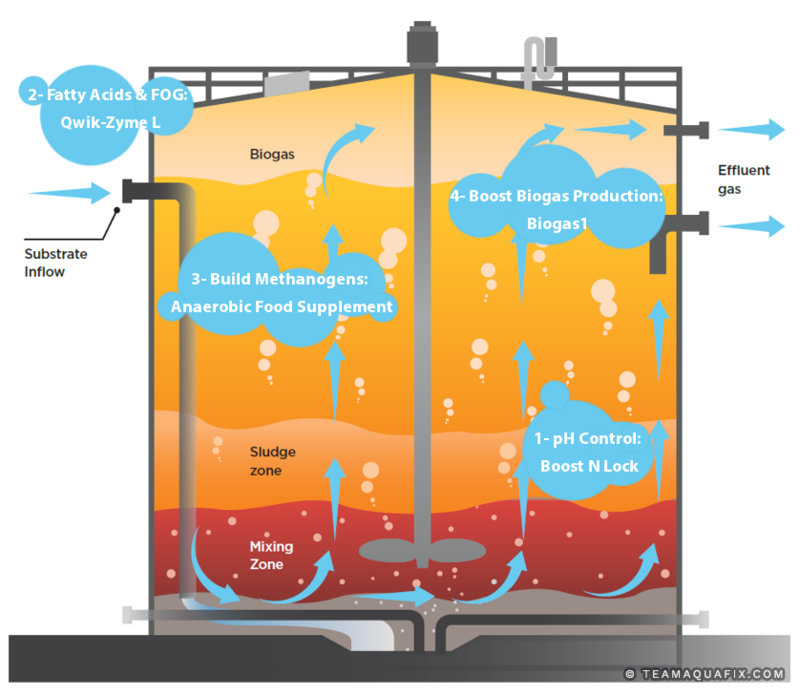 High solids content in anaerobic digesters also cause floating particulate matter which assists in trapping gas bubbles leading to small amounts of foaming. Generally speaking, anaerobic foaming requires a combination of high gas production, a surfactant, and high floating solids. Problems occur when the surface tension of a digester is reduced too much by a chemical surfactant, bio surfactants, and high volatile acids or very high alkalinity. The most common surfactant is acetic acid which is produced during acetogenesis. The levels of acetic acid get very high in an anaerobic system when methanogens (methane producers) cannot keep up with acetogenesis. A lot of the time this happens if the temperature in an anaerobic digester drops quickly. Initially this is paired with poor gas generation which means foaming is limited, but when alkalinity is added to increase the digester pH, methane and carbon dioxide production can resume while volatile acids are still in fairly high levels. This triggers a foaming event. Filamentous bacteria are typically identified as a cause of foaming but are not a true foaming cause in anaerobic systems. They are considered a foam stabilizer which essentially means that foaming problems will be much worse. These images illustrate the differences in visual appearance of Microthrix parvicella in aerobic and anaerobic conditions. 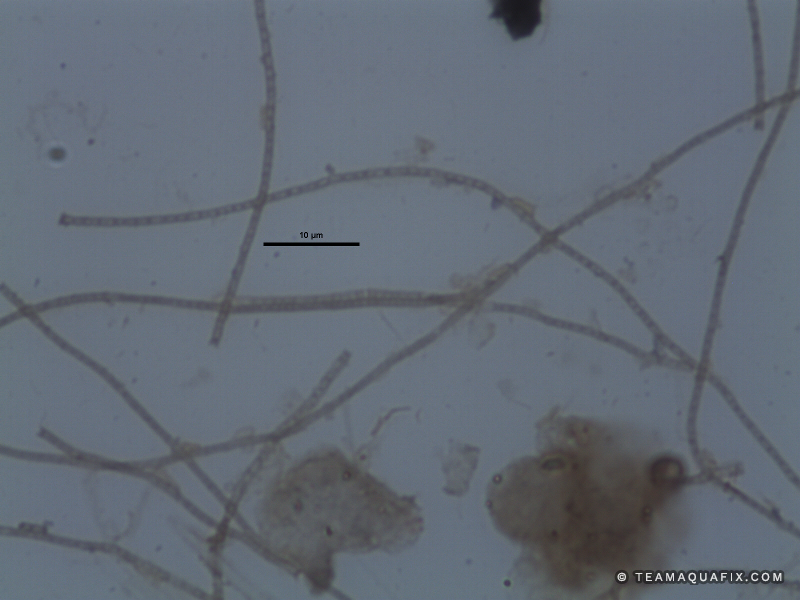 Microthrix parvicella and Nocardioforms require aerobic conditions to grow and reproduce, but can still cause significant foaming problems in anaerobic systems if these filaments enter from an activated sludge process. M. parvicella and Nocardioforms are capable of surviving in anaerobic conditions for over a month, and can assist in causing significant foaming incidents. These bacteria generally are not the direct cause of foaming in anaerobic conditions due to poor generation of bio-surfactants in anaerobic conditions but these bacteria will stabilize foams which can make a minor foaming incident into a massive foaming problem. The addition of a defoaming agent such as poly aluminum chloride can temporarily collapse foams due to filaments in anaerobic systems, but generally require high doses. Over time foaming control with poly aluminum chloride can be very expensive for this reason. 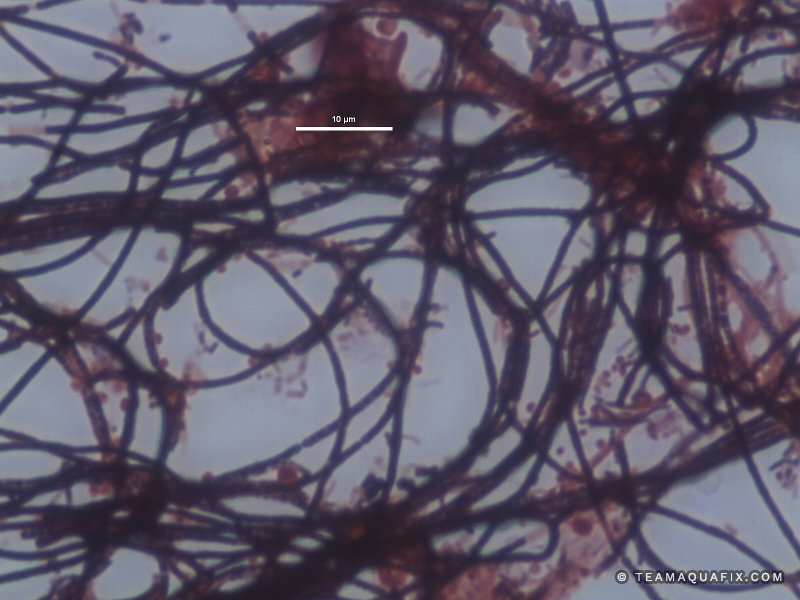 Poly aluminum chloride also fails to address the source of these filamentous bacteria. Since these bacteria reproduce and grow in aerobic systems, generally they enter anaerobic digesters from an activated sludge process. Both M. parvicella and Nocardioforms require a wastewater stream with relatively high FOG (Fats, Oils and Greases). The addition the Aquafix products, Qwik-Zyme-L and Foam Buster assist in the degradation of FOG which can prevent the rapid growth of M. parvicella and Nocardioforms. It is also important to increase wasting of sludge from an activated sludge system if these filaments are present, and if possible mechanically remove foam in order to remove filaments from the activated sludge system before they enter an anaerobic process. 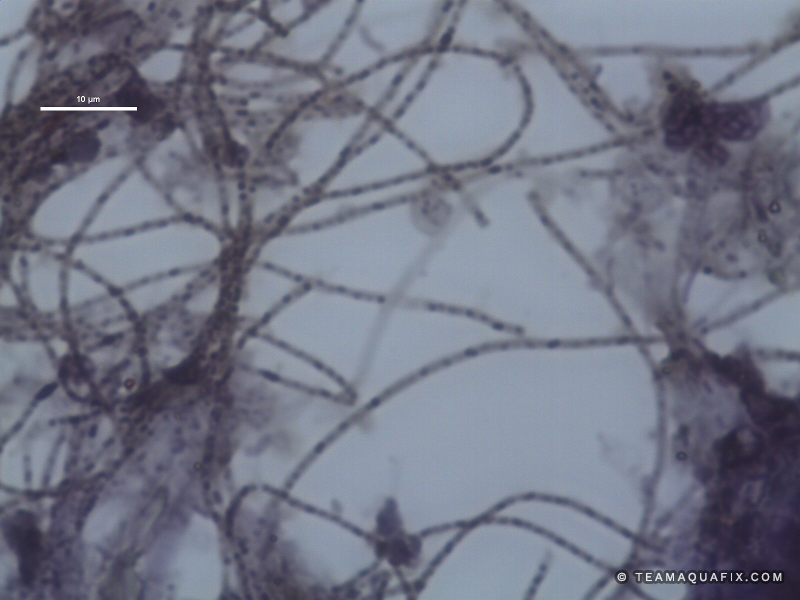 * M. parvicella and Nocardia in your plant may differ in appearance from these images. 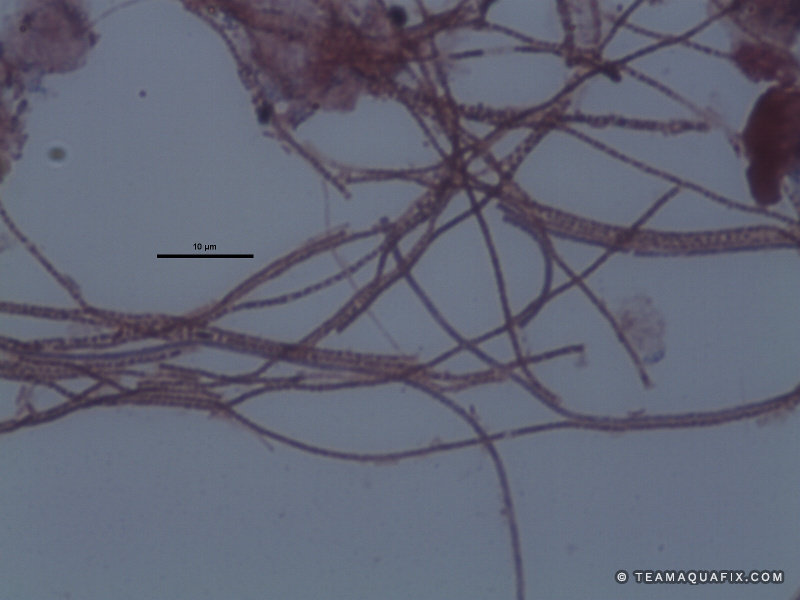 Filaments tend to change visually in anaerobic digesters. If you have any other questions, call us at 888-757-9577, email technicalservice@teamaquafix.com, or contact us. Suhartini, S., Heaven, S., & Banks, C. J. (2014). Comparison of mesophilic and thermophilic anaerobic digesterion of sugar beet pulp: Performance, dewaterability and foam control. Bioresource Technology, 152, 202-211. Alfaro, N., Cano, R., & Fdz-Polanco, F. (2014). Effects of thermal hydrolysis and ultrasounds pretreatments on foaming in anaerobic digesters. Bioresource Technology, 170, 477-482. Lienen, T., Kleybocker, A., Verstraete, W., & Wurdemann, H. (2014). Moderate temperature increases to leads to disintegration of floating sludge and lower abundance of the filamentous bacterium Microthrix parvicella in anaerobic digesters. Water Research, 65, 203-212. Ganidi, N., Tyrrel, S., & Cartmell, E. (2011). The effects of organic loading rate on foam initiation during mesophilic anaerobic digestion of munisipal wastewater sludge. Bioresource Technology, 102, 6637-6643. Ganidi, N., Tyrrel, S., & Cartmell, E. (2009). Anaerobic digestion foaming causes – A review. Bioresource Technology, 100, 5546-5554. Subramanian, B., & Pagilla, K. R. (2015). Mechanisms of foam formation in anaerobic digesters. Colloids and Surfaces B: Biointerfaces, 126, 621-630. Westlund, A. D., Hagland, E., & Rothman, M. (1998). FOAMING IN ANAEROBIC DIGESTERS CAUSED BY MICROTHRIX PARVICELLA. Water Science Technology, 37(4-5), 51-55. Fiorella Reyes, M., Reyes III, F. L., Hernandez, M., & Raskin, L. (1998). Quantification of Gordona amarae Strains in Foaming Activated Sludge and Anaerobic Digester Systems with Oligonucleotide Hybridization Probes. Applied and Environmental Microbiology, 64(7), 2503-2512. Subramanian, B., & Pagilla, K. R. (2014). Anaerobic digester foaming in full-scale cylindricial digesters – Effects of organic loading rate, feed characteristics, and mixing. Bioresource Technology, 159, 182-192. Subramanian, B., Miot, A., Jones, B., Kilbert, C., & Pagilla, K. R. (2015). A full-scale study of mixing and foaming in egg-shaped anaerobic digesters. Bioresource Technology, 192, 461-470. Hernandez, M., & Jenkins, D. (1994). The fate of Nocardia in anaerobic digestion. Water Environment Research, 66(6), 828-835. Heard, J., Harvey, E., Johnson, B. B., Wells, J. D., & Angove, M. J. (2008). The effects of filamentous bacteria on foam production and stability. Colloids and Surfaces B: Biointerfaces, 63, 21-26. Carr, E. L., Eales, K. L., & Seviour, R. J. (2006). Substrate uptake by Gordonia amarae in activated sludge foams by FISH-MAR. Water Science and Technology, 54(1), 39-45. Brown, S., & Sale, R. (2002). Operating a High-Rate Digester: The Sourther Water Experience. J.CIWEM, 16, 116-120. Moen, G. (2015). Anaerobic Digester Foaming: Causes and Solutions. Water Environment and Technology, 15(8), 70-73.